Chemistry Biology Track B.A. or B.S. Our lab studies interesting problems in organic synthesis and chemical biology. Our chemical biology program is directed at the design and synthesis of carbohydrate clusters which mimic important binding surfaces in biology. One target is the portion of HIV protein gp120 which is bound by 2G12, a broadly-neutralizing antibody which protects against the virus. Good mimics of this glycocluster have potential as HIV vaccines. 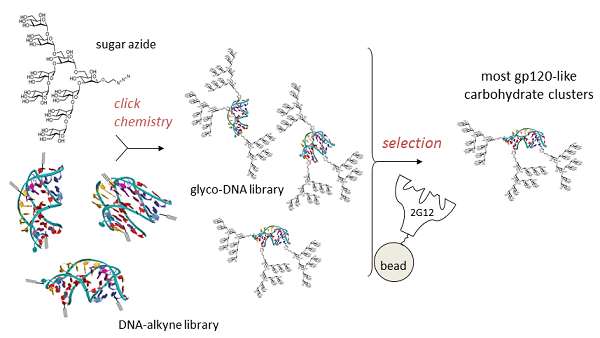 Rather than design and test individual glycoclusters, we are using a directed evolution-based approach, in which the best gp120 mimics are selected from a diverse glycocluster library by their ability to bind 2G12. This directed evolution is accomplished by attachment of sugars to a library of DNA sequences using click chemistry, a technique which we term SELMA (SELection with Modified Aptamers). We are also applying SELMA and related methods to other problems in molecular recognition. 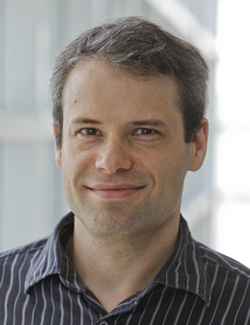 Our organic synthesis program is focused on study of mechanistically-interesting reactions which enable access to structural motifs that are difficult to access by other methods. One example is homoallylation reactions. Although a great number of allylation methods are known, known methods for synthesis of the one-carbon homologs are very limited, despite their utility as precursors of stereodefined tetrahydrofurans and tetrahydropyrans. In addition to development of these methods, we are also interested in their application to synthesis of interesting target structures. Oligomannose Glycopeptide Conjugates Elicit Antibodies Targeting the Glycan Core Rather than Its Extremities. Nguyen, D. N.; Xu, B.; Stanfield, R. L.; Bailey, J. K.; Horiya, S.; Temme, S. J.; Leon, D. R.; LaBranche, C. C.; Montefiori, D. C.; Costello, C. E.; Wilson, I. A.; Krauss, I. J. ACS Cent. Sci. 2019, 5, 237-249. Stereoselective Homocrotylation of Aldehydes: Enantioselective Synthesis of Allylic-Substituted Z/E-Alkenes. Tian, L; Krauss, I. J. Org. Lett. 2018 , 20, 6730-6735. Structural Characterization of Early Michaelis Complexes in the Reaction Catalyzed by (+)-Limonene Synthase from Citrus sinensis Using Fluorinated Substrate Analogues. Kumar, R. P.; Morehouse, B. R.; Matos, J. O.; Malik, K.; Lin, H.; Krauss, I. J.; Oprian, D. D. Biochemistry 2018 , 56, 1716-1725. Directed Evolution of Glycopeptides Using mRNA Display. Horiya, S; Bailey, J. K.; Krauss, I. J. Methods Enzymol. 2017 , 597, 83-141. DNA display of folded RNA libraries enabling RNA-SELEX without reverse transcription. MacPherson, I. S.; Temme, J. S.; Krauss, I. J. Chem. Comm. 2017 , 53(19), 2878-2881. Synthesis of Multivalent Glycopeptide Conjugates that Mimic an HIV Epitope. Bailey, J. K.; Nguyen, D. N.; Horiya, S.; Krauss, I. J. Tetrahedron 2016 , 72(40), 6091-6098. Antibody Recognition of HIV and Dengue Glycoproteins. Krauss, I. J. Glycobiology 2016 , 26(8), 813-819. Enantioselective syn and anti Homocrotylation of Aldehydes: Application to the Formal Synthesis of Spongidepsin. Lin, H. K.; Tian, L.; Krauss, I. J. J. Am. Chem. Soc. 2015 , 137(40), 13176-13182. SELMA: Selection with Modified Aptamers. Temme, J. S.; Krauss I. J. Curr. Protoc. Chem. Biol. 2015 , 7, 73-92. Recent Strategies Targeting HIV Glycans in Vaccine Design. Horiya, S.; MacPherson, I. S.; Krauss I. J. Nat. Chem. Biol. 2014 ,10, 990-999. Directed Evolution of Multivalent Glycopeptides Tightly Recognized by HIV Antibody 2G12. Horiya, S.; Bailey, J. K.; Temme, S. J.; Guillen-Schlippe, Y. V.; Krauss, I. J. J. Am. Chem. Soc. 2014 , 136(14), 5407-5415. (Highlighted in C&E News, 3/31/2014) Access the recommendation on F1000Prime. High Temperature SELMA: Evolution of DNA-Supported Oligomannose Clusters Which Are Tightly Recognized by HIV bnAb 2G12. Temme, S. J.; MacPherson, I. S.; DeCourcey, J. F.; Krauss, I. J. J. Am. Chem. Soc. 2014 , 136(5), 1726-1729. Directed Evolution of 2G12-Targeted Nonamannose Glycoclusters by SELMA. Temme, J. S.; Drzyzga, M.; MacPherson, I. S.; Krauss, I. J. Chem. - Eur. J. 2013 , 19(51), 17291-17295. Homoallylboration and Homocrotylboration of Aldehydes. Pei, W.; Krauss, I. J J. Am. Chem. Soc. 2011, 133(46), 18514-18517. (Highlighted in Synfacts 2012, 8, 203). Multivalent Glycocluster Design Through Directed Evolution. MacPherson, I. S.; Temme. J. S.; Habeshian, S.; Felczak, K.; Pankiewicz, K.; Hedstrom, L.; Krauss, I. J Angew. Chem. Int. Ed. 2011, 50(47), 11238-11242. Access the recommendation on F1000Prime. 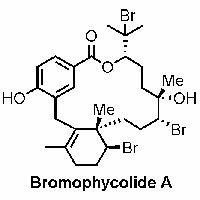 A Short Asymmetric Route to the Bromophycolide A and D Skeleton. Lin, H.; Pochapsky, S.S.; Krauss, I. J Org. Lett. 2011, 13(5), 1222-1225. Enzyme-Instructed Molecular Self-assembly Confers Nanofibers and a Supramolecular Hydrogel of Taxol Derivative. Gao, Y.; Kuang, Y.; Guo, Z-F.; Guo, Z.; Krauss, I. J.; Xu, Bing. J. Am. Chem. Soc. 2009, 131(38), 13576-13577. Confirmation of the structures of synthetic derivatives of migrastatin in the light of recently disclosed crystallographically based claims. Nagorny, P.; Krauss, I. J. Njardarson, J. T.; Perez, L.; Gaul, C.; Yang, G.; Ouerfelli, O.; Danishefsky, S. J. Tetrahedron Lett. 2010, 51(30), 3873-3875. Diverted Total Synthesis Leads to the Generation of Promising Cell-Migration Inhibitors for Treatment of Tumor Metastasis: In vivo and Mechanistic Studies on the Migrastatin Core Ether Analog. Oskarsson, T.; Nagorny, P.; Krauss, I. J.; Perez, L.; Mandal, M.; Yang, G.; Ouerfelli, O.; Xiao, D.; Moore, M. S.; Massague, J.; Danishefskhy, S. J. J. Am. Chem. Soc. 2010, 132(9), 3224-3228. A New Model for the Presentation of Tumor-Associated Antigens and the Quest for an Anticancer Vaccine: A Solution to the Synthesis Challenge via Ring-Closing Metathesis. Jeon, I.; Lee, D.; Krauss, I. J.; Danishefsky, S. J. J. Am. Chem. Soc. 2009, 131(40), 14337-14344. An oligosaccharide-based HIV-1 2G12 mimotope vaccine induces carbohydrate-specific antibodies that fail to neutralize HIV-1 virions. Joyce, J. G.; Krauss, I. J.; Song, H. C.; Opalka, D. W.; Grimm, K. M.; Nahas, D. D.; Esser, M. T.; Hrin, R.; Feng, M.; Dudkin, V. Y.; Chastain, M.; Shiver, J. W.; Danishefsky, S. J. Proc. Natl. Acad. Sci. USA 2008, 105(41), 15684-15689. Total Synthesis of Spirotenuipesines A and B. Dai, M.; Krauss, I. J.; Danishefsky, S. J. J. Org. Chem. 2008, 73(24), 9576-9583. Fully Synthetic Carbohydrate HIV Antigens Designed on the Logic of the 2G12 Antibody. Krauss, I. J.; Joyce, J. G.; Finnefrock, A. C.; Song, H. C.; Dudkin, V. Y.; Geng, X.; Warren, J. D.; Chastain, M.; Shiver, J. W.; Danishefsky, S. J. J. Am. Chem. Soc. 2007, 129(36), 11042-11044. Total synthesis of (+)-isomigrastatin. Krauss, I. J.; Mandal, M.; Danishefsky, S. J. Angew. Chem. Int. Ed. 2007, 46(29), 5576-5579. Highly Practical and Enantioselective Cu-Catalyzed Conjugate Addition of Alkylzinc Reagents to Cyclic Enones at Ambient Temperature. Krauss, I. J.; Leighton, J. L. Org. Lett. 2003, 5(18), 3201-3203. 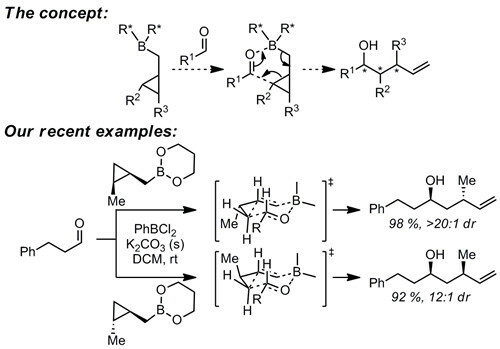 Highly Regioselective and Diastereoselective Directed Hydroformylation of Allylic Ethers: A New Approach to Propionate Aldol Synthesis. Krauss, I. J; Wang, C. C-Y. ; Leighton, J. L. J. Am. Chem. Soc. 2000, 123(46), 11514-11515. For a complete list of publications, see the complete Curriculum Vitae (PDF).